Italy has a rich tradition of love and romance. We gave the world Romeo and Juliette. Dante and Beatrice. Paolo and Francesca. At Cookies con Amore, we are Italian! We are romantics! We bake desserts from and for the heart! And so, from time to time, we’re asked how Italians celebrate Valentine’s Day. The truth is that the holiday isn’t celebrated as much in Italy as America. But in our years in California, we have grown to love this holiday and can’t think of a better way to celebrate than to share a simple, home-cooked dinner (and some Valentine’s cookies, of course) with our sweetheart. Here’s our three-step recipe for a sweet and romantic Valentine’s Day, Italian Style. When we owned our restaurant in Laguna Beach, Angelo would grab the microphone a few nights a week and delight our patrons with a few songs from the heart. He’s both a romantic and an Italian music lover. Here are some of his music choices for Valentine’s Day that you can easily download from iTunes or Amazon. Valentine’s Day falls on a Friday this year. Here’s a delicious and special, yet simple menu that is easy to prepare for your sweetheart after a long week of work, but that is also fun to prepare together. We’re seeing strawberries on special in our local Whole Foods grocery store. It’s a perfect fruit to pair with a mild cheese such as Fontina and some thinly sliced prosciutto, which will balance the sweetness of the strawberries with a bit of salty goodness. Hit up your local Italian grocery for an imported prosciutto. As it’s winter, we would go for something to warms us up from the inside. Perhaps a porcini risotto paired with an arugula salad. Serve with a dry white wine such as Gavi di Gavi. In matters of love and dessert, the Italian tradition is to temper the sweetness to provide a layered experience that can be savored. We developed this recipe just for Valentine’s Day. Place raspberries into a small bowl, add the brown sugar and juice of ½ lemon along with the brandy or Vin Santo mix together and lightly crush. Set aside. In another bowl add mascarpone, brandy, powdered sugar, gently wisk together until incorporated. Beat the heavy cream to a soft peek and fold into the mascarpone mixture . 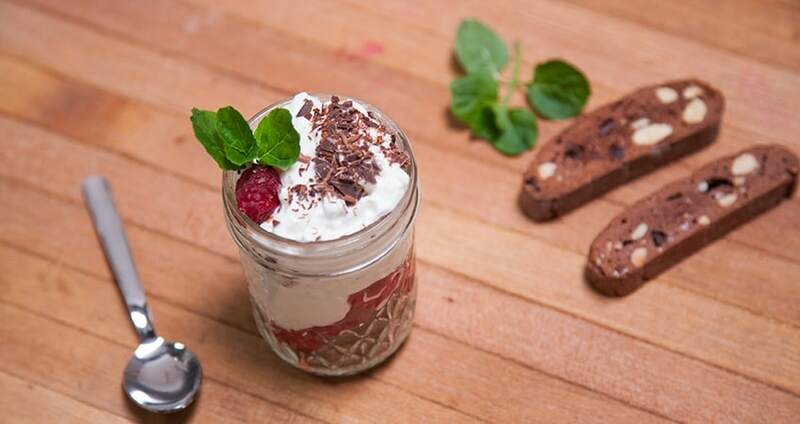 In two 8 oz glass jelly jars bottom layer first place half of the crumbled chocolate biscotti into each glass. Then on top of biscotti place half of of the raspberry mixture into each glass. On top of raspberry mixture add half of the mascarpone mixture into each glass. Refrigerate for 30 minutes. 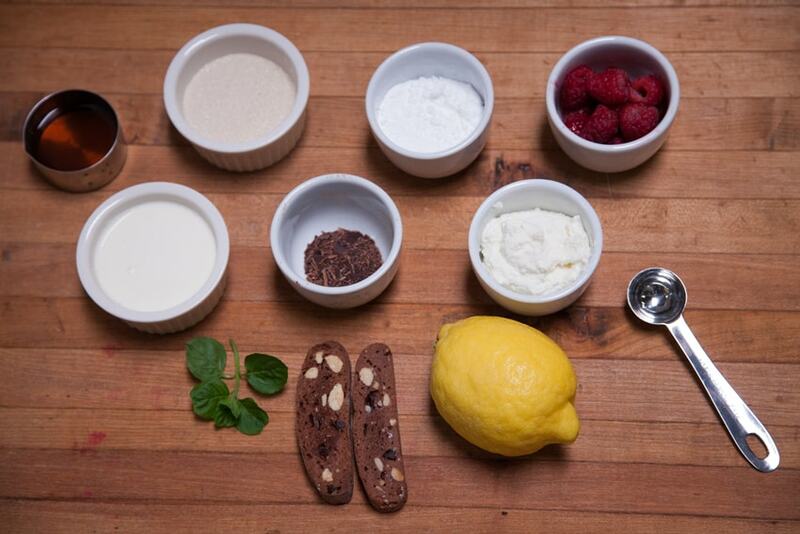 Top each glass with chocolate curls or shaving cocoa powder, fresh whole raspberries and mint leaf and serve. Serve with a side of Vin Santo. Wrap everything up with note written from the heart. Italians save “Ti amo” (I love you) for our most special sweethearts. A classic term of endearment is “Ti voglio bene” which means “I want all the best things for you” and it’s spoken between parents and children as well as boyfriends and girlfriends. These days, I hear that teenage lovebirds sign off their texts with TVTB for “ti voglio tanto been” (I love you so much). To keep the amore beating strong for a couple of week, you might want to give your sweetheart one of our special assortment of Valentine’s cookies, also available for gluten-free Valentines. Hope you and your special someone enjoy the holiday. We’d love to hear your suggestions and recipes for a sweet Valentines Day. Let us know how it goes … Ciao!